With Autopilot, you can build conversational applications such as messaging bots, interactive voice response (phone IVRs), or voice assistants. You can build once and deploy across multiple channels including Voice, SMS, Slack, Google Assistant, and Alexa. 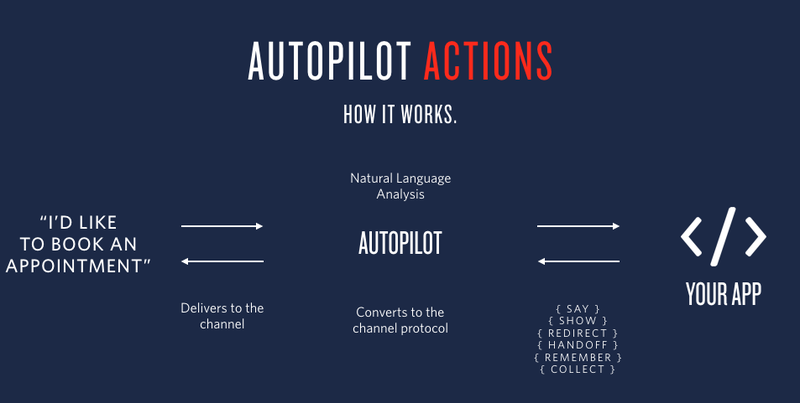 Autopilot uses Twilio's powerful Natural Language Processing and machine learning engine that allows a virtual assistant to understand in real-time the meaning of incoming communication, regardless of channel. Autopilot is the first fully programmable conversational application platform that enabled developers to build dynamic conversational flows. Build - Tasks represent what the assistant can do. Each task is programmed with Actions that instruct the assistant how to perform the Task. Actions are defined in JSON format. Train - If you have a single-task assistant, you don't need training. However, if your assistant can do multiple things you'll need to train it to understand users and map commands to a given task. Test - Once a model is built, you can test the assistant's understanding. You do this by making Queries against the model with examples of how users would ask to perform various tasks. The result of the query will tell you whether an intent was identified. Launch - Once your assistant can understand and respond, you're ready to go. You can launch your assistant in any of Autopilot's supported Channels. Twilio Autopilot is currently available as a BETA product. Some features are not yet implemented and others may be changed before the product is declared as Generally Available. BETA products are not covered by a Twilio SLA. See this article for more information on Beta product support. We're always ready to help you with your implementation and best practices as you build with Autopilot. Get help from our support team, or lean on the wisdom of the crowd browsing the Twilio tag on Stack Overflow. To stay updated on Autopilot product developments follow our blog. If you have questions related to pricing you can reach out to our Sales team.